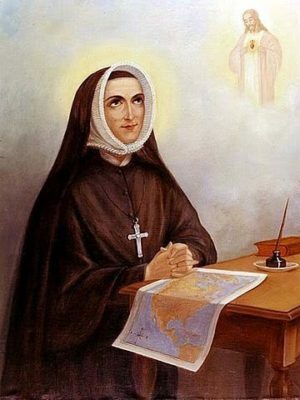 Saint Rose Philippine Duchesne, Virgin - My Catholic Life! Today’s saint was born into a large, refined, educated Catholic family in an enormous home in the venerable city of Grenoble, France. Rose’s parents and extended family were connected to other elites in the highest circles of the political and social life of that era. Despite this favored parentage, Rose would leave the world and all the advantages she inherited to become a hardscrabble missionary nun serving rough settlers and Indians in a no man’s land on the American plains. Saint Rose was named after the first canonized saint of the New World, Saint Rose of Lima. As a child, her imagination had been fired by hearing about missionaries on the American frontier. She dreamed of being one of them, yet her path to becoming a pioneer missionary would be circuitous. When Rose felt the call to a contemplative religious life as a teen, she joined, against her father’s wishes, the Order that so many French women of status joined—the Congregation of the Visitation, founded by Saint Jane Frances de Chantal in the early seventeenth century. The massive social upheavals of the French revolution shuttered her Visitandine convent, though, and she spent years living her Order’s rule privately outside of a convent as her country disintegrated into chaos. When religious life was no longer illegal, Rose tried to re-establish her defunct convent by personally purchasing its buildings. The plan didn’t work, and Rose and the few remaining sisters united themselves to a new French Order, which would later be known as the Religious Sisters of the Sacred Heart. Saint Rose was destined to be a holy and dedicated nun in her Order’s schools. But in 1817 a bishop serving in the United States came to France on a recruitment tour, as so many bishops did in the first half of the nineteenth century. The bishop visited Rose’s convent in Paris, and Rose’s childhood dreams were rekindled. After receiving permission from her superiors, in 1818 Rose boarded a ship with four other sisters for the two month sea voyage to New Orleans, U.S.A. The second act of her life was starting at age forty-nine. From this point forward, her life was replete with the physical hardships, financial struggles, and everyday drama typical of the French and Spanish missionaries who brought the faith to the ill-educated pioneers and Indians on the edge of the American frontier. Rose and her troupe of sisters had to take a steamboat up the Mississippi river to Missouri after the bishop’s promises to them for a convent in New Orleans came to nothing. In remote western Missouri, Rose began a Sacred Heart convent in a log cabin, and then a school and a small novitiate. The people were poor, the settlers generally unschooled, the weather cold, the food inadequate, and life hard. Rose struggled to learn English. Yet after ten years, the Sacred Heart sisters were operating six convents in Missouri and Louisiana. In 1841, the sisters were asked to serve Potawatomi Indians who had been harshly displaced from Michigan and Indiana to eastern Kansas. At seventy-one years old, Rose joined this missionary band not for her practical usefulness but for her example of prayer. Half of the Potawatomis were Catholic, many of them ardently so. They were deeply impressed by Sister Rose and called her “The Woman Who Prays Always.” Rose’s letters from her one year at the Potawatomi mission vividly describe frontier life and the evangelization efforts of Catholic missionaries. Ill health and cold forced Rose to return to a more humane convent existence away from the rugged frontier for the last years of her life until she died quietly. She was beatified in 1940 and canonized in 1988. Saint Rose, you persevered heroically in your vocation despite serious challenges. Inspire all religious to continue in their unique vocations despite setbacks, and to unite, as you did, a quiet contemplative soul with a missionary’s courage and drive.